iDancehallReggae.com::Caribbean Lifestyle Media::: IRT Ryddimz & Shortman Movements "New Era"
IRT Ryddimz & Shortman Movements "New Era"
New York – July 28th 2009 – I.R.T. 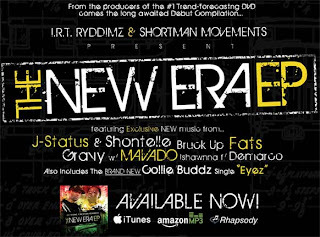 Media Group LLC, the production house behind the IRT Ryddimz DVD series, announces the release of its first Digital EP today, entitled "The NEW ERA." Shortly after signing with leading digital distributor IODA last August, The Fader magazine hailed I.R.T. as “a homegrown media outlet just hitting its stride.” Partnered with DJ Shortman Movements of the Heavy Hitters for this project, I.R.T. continues to push the envelope by releasing a compilation of innovative and cutting edge Caribbean-influenced artists and producers. "We’re trend-forecasters and this project is a musical extension of that," explains Executive Producer and I.R.T. co-founder Kamau Edwards. "As a Caribbean American who has had the privilege of working with an icon like P.Diddy, I’ve realized my culture is very influential in music. From Kool-Herc to Billy Ocean, Caribbean influence is in the fashion, language and entrepreneurial spirit unique to New York." I.R.T. and Shortman Movements began the project late last year, when local artist Fats recorded the street anthem ‘Round Here,’ sampled from an IRT Ryddimz DVD sound bite by Antiguan producer Jus Bus. ‘Round Here’ is the essence of Brooklyn," says Shortman. "It's one of the reasons we selected 'Sunglasses' by dancehall legend Bruck Up as the next single. It’s unique, but catchy in a way that appeals to a widespread audience." Treated to an impromptu performance by Bruck Up at I.R.T.’s listening preview last month, ‘Sunglasses’ has been immensely well-received by tastemakers, media and the dozens of key DJs who have eagerly added it to their play lists. Despite a hectic tour schedule, Collie Buddz took time to contribute the single ‘Eyez’, about needing to have a pair in the "backa ya head". Listeners will undoubtedly relate to ‘Pieces’, a song about picking up after heartbreak, by emerging R&B group J.Status (production-mates with Rihanna) and SRC/Universal artist Shontelle. Newcomer Ishawnna sings the enchanting ‘For You’ alongside the track's producer Demarco (E1/Koch), which is already a favorite in the dancehall community. Perhaps the most interesting collaboration on “The NEW ERA” took place between “Notorious” star Jamal 'Gravy' Woolard and dancehall hit-maker Mavado. The resulting ‘Grudge,’ produced by Dangerous, LLC (50 Cent, G-Unit), is poised to become a New York anthem. As Edwards notes, “we owe it to Caribbean music to continue raising the bar. That’s what the “NEW ERA” is about, sophisticating culture while maintaining its authenticity.” In preparation for this project and upcoming releases, the I.R.T. web presence has been completely renovated. The content-driven, visually absorbing, new site reflects the innovation and resonance that have always defined the I.R.T. brand’s DNA.